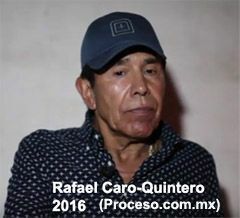 The DEA and Mexico (at the request of the U.S.) have been trying to find Rafael Caro-Quintero since 2013, when Mexico released him from prison after serving 28 years of a 40 year sentence, following a court decision later reversed. Caro-Quintero Writes MX President: "I've Paid Enough"
Rafael Caro-Quintero, freed from prison in Mexico after 28 years when a court in Mexico reversed his conviction (a decision later reversed by a reviewing court) has written a letter to Mexican officials urging them to reject the U.S. demand for his extradition. He is charged in federal court in California with the 1985 murder of DEA Agent Kiki Camarena. Did politics and the DEA get to the Mexico Supreme Court? The Court has overturned the August order of an appeals court releasing Rafael Caro-Quintero (background here.) Caro-Quintero served 28 years before an appeals court reversed his conviction, finding the federal court in Mexico lacked jurisdiction because since DEA Agent Camerena was not a consulate official or diplomat, Caro-Quintero should have been tried in state court. After a meeting in Washington in September, Mexican Attorney General Jesús Murillo Karam promised that authorities in his country would reapprehend Caro Quintero. 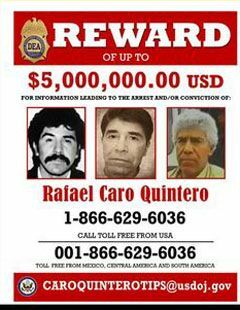 The U.S. is now offering a $5 million reward for Caro-Quintero's arrest. His whereabouts are unknown.